Buy from Collected Works or from your local independent bookseller. Like so many young people in the 1960s, my then-husband and I wanted to do good. And having an adventure was a good idea, too. We set off for Chinle, Arizona, heart of Navajo Country in the wake of two assassinations – Martin Luther King, Jr. and Bobby Kennedy. They were turbulent, frightening times, but also there was hope and optimism that things were going to get better. My husband, newly graduated from law school, opened the first legal services office in Chinle. He was busy from the first day. But for me, it was less clear. What was I to do with my college degree in Modern English and French History and Literature? My cross-cultural memoir reflects on those years spent in a very foreign land, and how we adjusted and came to feel at home. In the process I learned to accept myself as an outsider and I found ways to be useful – teaching Headstart, serving as Justice of the Peace, and selling car insurance, to name a few. 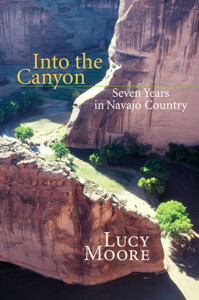 “Into the Canyon: Seven Years in Navajo Country” (University of New Mexico Press 2004) won the Best Memoir award from Women Writing the West in 2005. In 2005 I met Carolyn Wing Greenlee, an amazing poet, artist and woman. Dealing with a degenerative eye problem, she “ordered” me to record my book, and being obedient, I did so. The set of 9 CDs, unabridged and read by me, are available by contacting this site. “Into the Canyon” is a quietly thought-provoking, delightful book, and it is practical on several levels. Anglos might consider “Into the Canyon” a guide to interaction with Navajos. A delight to read; an invaluable historical and cultural narrative. Moore has an easy way with language that lets her make simple yet powerful points and observations, all of which derive organically from the stories she relates.